Workers compensation insurance companies are working against you when you get hurt on the job. It surprises most people who get hurt at work. They have a bad back injury, knee injury, need doctor's visits, therapy, maybe even surgery. And they need income since they can't work due to the injury. But the workers comp insurance on your job is not your friend. They are different from your employer and you may have a great long term relationship with your supervisor, HR or the head of your company. But when it comes to a work injury, its out of your job' s hands. It's not that they don't care, but they won't be making the decisions, an insurance company will. These are all things an experienced workers compensation insurance adjuster can and will do to you. Remember that insurance adjuster has handled hundreds or thousands of workers compensation claims for the insurance company. You only have one case - don't take the risk that you won't be able to feed your family or get the medical care you need. 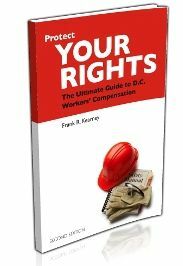 Read and study the only book written by a board certified civil trial attorney with 20 years experience helping seriously injured workers and their families, The Ultimate Guide to D.C. Workers Compensation, available for sale on Amazon or order a FREE copy today from our website.